Source: Betrayal, Bill Gertz, Washington, D.C., 1999. ISBN 0-89526-317-3. Thanks to Bill Gertz. 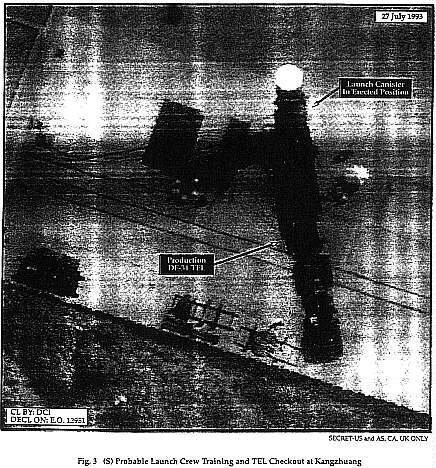 From an Appendix of 59 images of classified government documents, pp. 219-84. (S) Beijing may be trying to buy advanced technology associated with Moscow's SS-18/SATAN heavy ICBM. Although neither Moscow nor Kiev is likely to sell a complete SS-18 to Beijing, either might sell SS-18-related military technology or a booster for use as a space launch vehicle. (S) East European attaches in Beijing said that the Vice Chairman of the Central Military Commission Liu Huaqing visited Moscow in mid-December, the Chinese expressed great interest in purchasing SS-18 ICBM components. The Chinese reportedly claimed they were only interested in using SS-18 boosters for their civilian space launch programs. (C) An SS-18/SATAN in Its Launch Canister Without the Front Section. China may purchase technology related to this most lethal of Russia's ICBMs. (S) The Ukrainian attache said the Chinese delegation approached Russian officials regarding a possible SS-18 ICBM purchase. Another East European attache, however, said Kiev was discussing an SS-18 deal with China. (S) Ukrainian President Kuchma signed a space technology cooperation agreement with Beijing during his December visit to China. This arrangement reportedly creates a standing Sino-Ukrainian coordinating committee., but the two sides have not publicized specifics of this accord. Kuchma is a former director of the Yuzhnoye SS-18 production facility in Ukraine. (S) Beijing has tested a series of Long March space launch vehicle (SLV) boosters and has invested heavily in its latest heavy-lift Long March 3B and 3C programs and the Long March 4-B booster. China's interest in using SS-18 boosters in its civilian space program seems odd because SS-18 engine characteristics may be incompatible with many sensitive satellite payloads. Beijing could be planning to develop a manned space vehicle under its new 5-year plan: Chinese interest in the Russian missile's engines may be linked to such a program. (S) Even though Beijing claims it is pursuing SS-18 technology for its SLV program, any Chinese interest in the SATAN missile has military implications. Its inquiries are taking place as China is updating its strategic missile forces. Beijing is working on an improved version of the CSS-4 ICBM and seems to be planning to incorporate MIRV technology into its missile force. (S) China's interest in Russian SS-18 military technology probably is linked to Beijing's strategic force modernization, particularly the areas of missile guidance, accuracy, rocket engines, and warhead improvements. Incorporating SS-18-related military guidance or warhead technologies into China's Strategic Missile Forces would greatly improve Beijing's ability to threaten targets in the United States. (S) Beijing already has a strong military technology-sharing arrangement with Moscow. Much of the missile and other arms-related technology flows from Russia to China outside official channels. Chinese scientists and institutes have approached Russian institutes directly for technology -- including that related to ballistic missile guidance and control -- that is unavailable through official channels. Many of these scientists have been recruited by the government to support its military upgrading plans. Russia has made no discernible effort to curtail these exchanges. (S) Arms agreements permit other countries to use former ICBMs as SLV boosters as long as the nation of origin maintains control of all launch procedures. Considering the current scope of Russian arms and technology sales to China, however, Moscow may sell SS-18-associated military technology to Beijing. (S) Neither Moscow nor Kiev is likely to sell a complete SS-18 ICBM to Beijing because neither would see such a sale as being in its national interest. Russia or Ukraine may be willing to transfer some sensitive military technologies associated with the SS-18 to support combined SLV and military projects with the Chinese. Many of these technologies could enable China to improve the reliability and accuracy of its strategic nuclear forces. DISTS 981-1873; MID -23-4A "...SS-18-related military guidance or warhead technologies ... would greatly improve Beijing's ability to threaten targets in the United States." (U) China has designed an upper rocket stage called the ''Smart Dispenser" (SD) for a new space launch vehicle, derived from the CZ-2C, for the purpose of accurate and simultaneous deployment in orbit of two US-made Iridium mobile-telecommunications satellites. China currently has contracts for six such launches plus options for five more. A demonstration launch is currently planned for early 1997. (U) The technology built into the SD stage has many potential uses beyond the Iridium mission. The SD stage will contain its own solid- and liquid-propulsion systems, avionics (including a guidance system), and telemetry systems which will provide the Chinese with new on-orbit maneuvering capabilities not previously available with past Chinese space launch vehicles. (S) An initial NAIC study determined that a minimally-modified SD stage could be used on a ballistic missile as a multiple-reentry vehicle post-boost vehicle (PBV) but it would have poor capability in terms of its crossrange and downrange footprint. However, the stage could be developed into a credible PBV with a few relatively minor changes. Thus, the SD stage can be considered a "technology bridge" to a viable PBV. The same could be said for an orbital rendezvous platform for future manned missions or a co-orbital anti-satellite payload. (C) The new space launch vehicle that will use the SD stage for launching Iridium satellites is currently called the CZ-2C/SD. Although all current Chinese launch vehicles use related technologies and sub-systems, the Iridium CZ-2C/SD launch vehicle is effectively a new launch vehicle, significantly modified from the original CZ-2C. Major differences include upgraded first and second-stage engines, a stretched second stage, an additional third stage (the SD stage), modified equipment bay, and a new fairing. The same designator was possibly kept in order for China to claim the reliability statistics of the CZ-2C. (S) An assessment was done on the SD stage to determine its viability for use as low performance post-boost vehicle (PBV) on the Mod CSS-4 ICBM. This effort was to assess the PBV performance of the SD stage with a minimum number of modifications. There is no data, whatsoever, that the Chinese have embarked on the development of a PBV based on the SD stage. This is simply an initial determination of feasibility. To date, the Chinese have expressed an interest in developing a multiple reentry vehicle capability that a PBV would provide, however, no known testing of such a system has occurred . (S) The overall conclusion of this initial feasibility study shows that a minimally modified SD stage could be used to deploy multiple reentry vehicles (RVs). However, when compared to U.S. or Russian PBVs, it would be one of the least capable in terms of its crossrange and downrange footprint. However, with a few relatively minor changes beyond the ones mentioned below, the SD could easily become a credible PBV. Thus, it is concluded that the SD stage can be considered a "technology bridge" to a viable PRV. (S) The following assumptions were made to constrain the SD-stage modifications. First, only the minimum number of changes would be allowed to the stage to get the job done. The system would not be needed for range extension since the missiles which would most likely use this system, the Mod CSS-4 and the DF-41, would have sufficient range already. The system would deploy three 470-kg Dong Feng 31 (DF-31) RVs. The system would not contain penetration aids (penaids). In addition, all 12 pitch/yaw thrusters would be used for axial thrust. Furthermore, it was assumed that these 70 N thrusters could withstand the full 128 second continuous burn. Additionally, the modified SD stage would have 20 degree/second rotation and turn rate. Lastly, the payload shroud would have a mass of about 200 kg and would be jettisoned early during second stage burn. (S) Three modifications were identified, two significant and one minor. First, the 163-kg solid propellant kick stage was removed because of the no-range-extension assumption. Secondly, the six pitch and six yaw thrusters were rotated through 180 degrees to turn the PBV into a tractor system, minimizing the amount of fuel required for the deployment maneuvers. Lastly, the 15-kg thermal control system was removed. The masses of the conceptual PBV are shown in Table 3. (U) The purpose of this newsletter is to provide a timely update of the activities and developments of foreign countries in the area of ballistic missiles. Included is a list of currently published products. Future issues of this newsletter will be published at least two times per year. If you have any questions on a technical highlight or are interested in any of the documents listed, please contact NAIC/TAB; commercial & Stu (513) 257-2640, DSN & Stu 787-2640. (S) After many delays, Beijing is proceeding with late-stage development of its DF-31 ICBM (Figure 1). This newest generation Chinese ballistic missile will narrow the gap between current Chinese, US, and Russian ballistic missile designs. The DF-31's mobility and defense-penetration ability will allow it to threaten parts of the continental United States and many US allies, as well as US forces in the Pacific theater. (S) A probable payload test associated with the DF-31 has been postponed: possibly cancelled. By mid-October, the booster for this test had been removed from Pad D at Wuzhai. Simultaneously, two cold-launched ejection tests of DF-31 mass simulators, one of very high fidelity were conducted. An integrated missile flight-test is likely within the next six months. (S) The DF-31 development program is highly ambitious. Beijing's desire for a mobile 8000-km range ballistic missile (See Figures 2 and 3) incorporating many new or advanced technologies is presenting Chinese designers with substantial challenges. The DF-31 quite likely incorporates design aspects similar to those of current-generation Russian missiles. These could include upgraded mobility for the transporter-erector-launcher; advanced materials for the booster and payload; use of penetration aids such as decoys or chaff; and an improved solid propellant. (S) Since the 1991 Gulf War China probably has reemphasized accuracy and defense penetration as primary goals for its developmental ballistic missiles. The Chinese gave evidence of this intent by testing two probable endoatmospheric reentry decoys on each of their two most recent ballistic missile R&D flight tests: a CSS-5 Mod 2 on 10 November 1995 and a CSS-5 Mod 1on 10 January 1996. The decoys are designed to survive harsh atmospheric reentry conditions and to simulate characteristics of the actual RV. 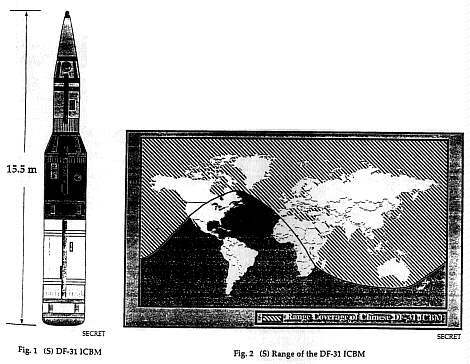 The DF-31 ICBM is likely to use similar decoys and other types of penetration aids. (S) The DF-31 ICBM will gave China a major strike capability that will be difficult to counterattack at any stage of its operation from pre-flight mobile operations through the terminal flight phase. After the Chinese start to deploy DF-31s about the turn of the century, Beijing probably will begin to decommission its operational force of CSS-3s. China will then be on its way to a ballistic missile force based around road-mobile systems. Road-mobility will greatly improve Chinese nuclear ballistic missile survivability and will complicate the task of defeating the Chinese threat.